Jon Boyd says he doesn’t have enough cream pies in his life. So this year, we’re out to set that straight. “Ann is so wonderful, but she has just one fault,” Jon is fond of saying. For many years, my tragic flaw was my refusal to eat onions in any form — or even to let anyone else eat them. This lifelong aversion suddenly, totally, and mysteriously vanished while I was pregnant with Lucy. Go figure. Then, it was my utter failure to choose appropriately sized tupperware containers for leftovers. All my life, I consistently chose ones that were wildly too small or too large for the intended contents. But again, I have somehow overcome this challenge in the past year and often find myself hooting with triumph as I pour the last bit of leftover soup into the perfect container. I do remind Jon of the chocolate cream pie I made for his unbirthday back in March 2011, but he seems to think once in twelve years is not frequent enough. So in a fit of exasperation last month, he cried, “I think you should bake a cream pie every month for a whole year!” How can you blame him? And how can I resist a bold vision like this? I accept the challenge! I will make a different cream pie every month for a year. Ready, set, go! But first, let’s count the cost. It’s true that I don’t make a lot of cream pies, and that’s because I feel that they are inconvenient. Their size, for example, is both too big and too small. They are too big for one family: you really need a party of eight people to finish the thing. But one pie is too small to feed a crowd of 30 co-workers. So, you eat some pie, and then you must deal with the awkward leftovers. Since cream pies do not fare well in the freezer, you cannot eat it next week, which means you must commit to eating a great deal of pie over the course of several days (which is fine, but then that means eating only broccoli for dinner, and I tire of that). Or you can try to share the leftover half-pie with friends — but to do so, you must find just the right number of friends (not too many in one family), they must have access to sturdy plates and forks (again, probably not at work), and they must live close to your refrigerator (no mailing cream pies). As if all this weren’t inconvenient enough, you must spend a good chunk of time blind-baking that crust, making the filling, chilling everything, and in the end you just have one measly pie to show for it. So, why make cream pies? There is really only one, simple reason — but it is sufficient: They are extremely delicious. No matter what flavor you make, cream pies just have a lot of wonderful contrasts going on: the smooth, cool filling; the crunchy, slightly salty crust; and the billowy whipped cream on top. 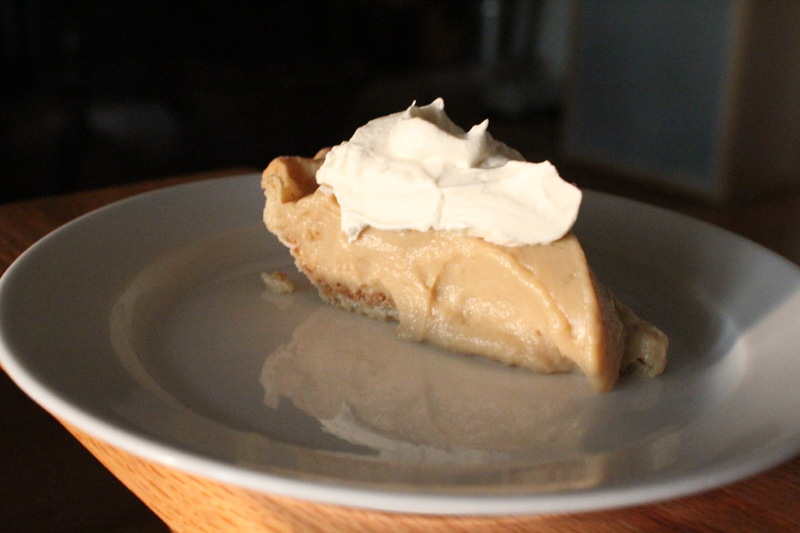 In late August, we took on the first stage of the Great Cream-Pie Challenge: a butterscotch (click photo to enlarge, and see the recipe below). I grumbled through baking the crust early one morning to beat the heat of the day, but then I became more enthusiastic while licking the bowl of filling clean later in the morning. When dinnertime rolled around and we topped it with whipped cream, I was truly surprised at how delicious it was: not only the great contrast of textures, but also the slightly salty but perfectly sweet and caramelly filling. Yum! September’s installment was maybe even better, as I wanted to pull out all the stops for Jon’s birthday treat. That meant we wanted to have an intensely chocolatey cream pie, and to make it just a little bit extra-special, I decided to top it with an incredible caramel whipped cream. Yes, caramel whipped cream! It was as amazing as it sounds. So here we are: two months down, ten to go. There are quite a few traditional cream pies we have yet to tackle: the coconut cream, the banana cream, the vanilla cream. But where to go from there? What kinds of creative pies can we imagine over the next several months? Do you think a chocolate-peppermint one would do well for Christmas? Or maybe that month should be a gingerbread cream? What about layering some caramelized apples within a peanut-butter flavored cream? (Is peanut-butter cream even possible?) What kind of pie — pink, without doubt — shall I make for Valentine’s Day? And in how many ways can I healthfully prepare broccoli in order to balance out the calorie deluge during pie weeks? Suggestions are warmly welcomed as I tackle the Great Cream-Pie Challenge! For the Filling. Dissolve the cornstarch and salt in the evaporated milk; whisk in the egg yolks and set aside. Meanwhile, heat the butter and brown sugar in a medium saucepan over medium heat until an instant-read thermometer reads 220°F, about 5 minutes. Gradually whisk in the milk. Once the sugar dissolves, gradually whisk in the cornstarch mixture. Continue cooking until the mixture comes to a boil; cook 1 minute longer. Turn off the heat, then stir in the vanilla. Pour the filling into a shallow pan or bowl. Put plastic wrap directly on the filling surface to prevent a skin from forming; cool until warm, 20 to 30 minutes. (The authors make a big deal out of waiting precisely this long, so the filling is warm but not hot, before pouring it in the pie.) Pour the filling into the pie shell and, once again, place a sheet of plastic wrap on the filing surface. Refrigerate until completely chilled, at least 3 hours. To serve. Beat the cream and sugar with an electric mixer at medium speed to soft peaks; add the vanilla. Continue to beat to barely stiff peaks. Spread the whipped cream over the filling and serve immediately. Or if you anticipate leftovers, dollop the cream filling on individual slices of pie. Unless your children don’t like whipped cream, in which case you might encourage them to try a spoonful on the side. When you’re ready to bake the crust, preheat the oven to 375°. Take about ½ cup of finely crushed graham cracker crumbs and press them into the refrigerated pie shell. It helps to use a glass or something to press them in pretty well. They won’t all stick perfectly — but that’s okay. You want the bottom coated with graham cracker crumbs to prevent sogginess later. Once it is nice and crumby, stick the dough-lined pan into the freezer. Leave it there for 20 minutes, or at least as long as it takes for your oven to preheat. Now, take a nice long sheet of aluminum foil and fold it, doubled over. Line your pan with it, covering over the edges. (Now do you see why this is such a pain? And why I don’t make a lot of cream pies unless I receive an irresistible challenge?) Fill the pan with coins; we favor pennies. Stick the pan with foil and coins in the oven and bake for 25-30 minutes. They say to bake it “until the dough looks dry and is light in color.” When it looks like that, “carefully remove the foil and weights by gathering the corners of the foil and pulling up and out.” (This sounds terrifying, but just do it quick and it will probably be okay.) Then, put the naked crust back in the oven for about 12 minutes, until “deep golden brown.” Then cool that puppy until you’re ready to fill it with butterscotch heaven. If you’re inclined to make a chocolate cream pie, you can press Oreo crumbs (after removing the frosting and feed it to the nearest children) into the crust. That’s yummy. If you’re not as completely obsessive as I am, you can get a store-bought crust and save yourself a big chunk of your life. I hear the Trader Joe’s ones are good, made with all butter. Yum! Raspberry would be perfect for Valentine’s Day! My mom used to make a creme de menthe cream pie that was amazing. Crust was chocolate and graham. Had a bite of liqueur to it that was just right. Sometimes served with chopped nuts on the side. Wow — I’ve never heard of a creme de menthe cream pie! I can imagine that the chocolate/graham crust was perfect with it! great ideas. What a charming notion this is! A treatise, really, in favor of cream pies! 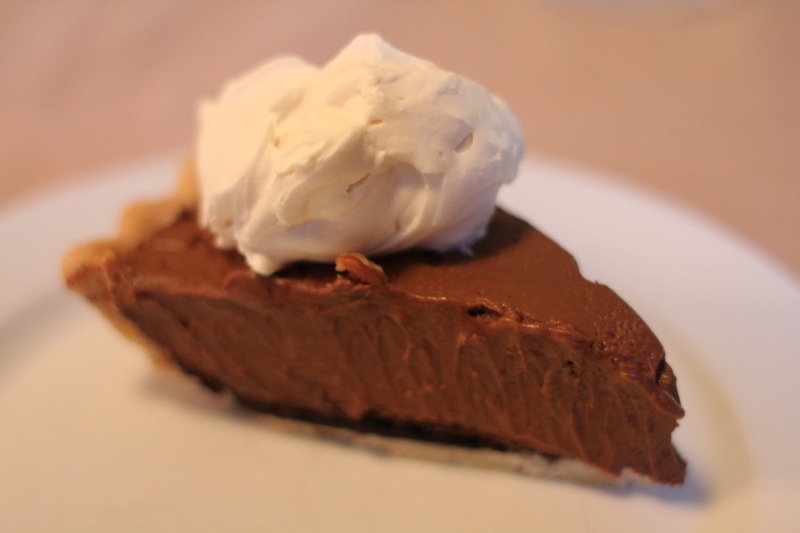 We so appreciate you mentioning and linking to our chocolate cream pie recipe. Looking forward to seeing your next selections…. Thanks for your comment, Renee! I do love that chocolate cream pie recipe — it’s a winner! Do you have any older or single neighbors to whom you could deliver a piece to help with the leftover dilemma ? 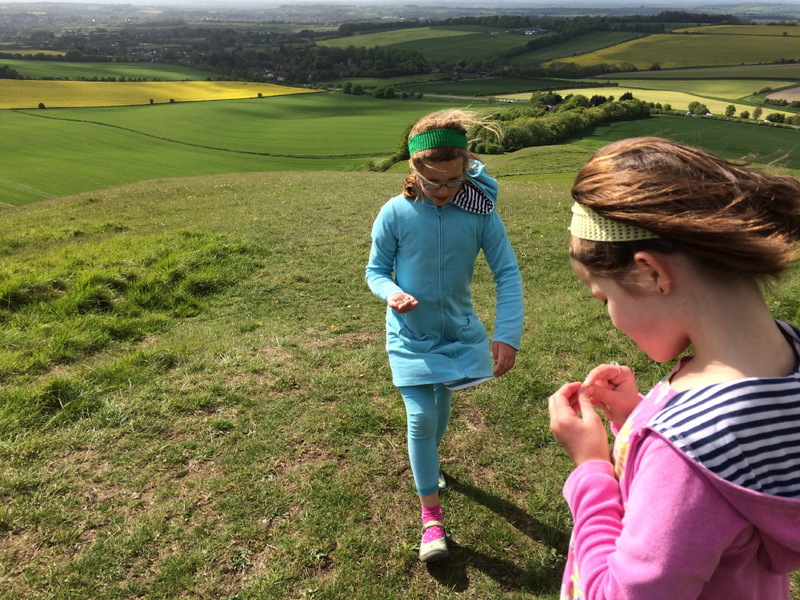 I’m thinking the extra walk could help counteract the rich dessert. Maybe not as healthy as broccoli though. I love the pie challenge and may even attempt a cream pie myself!